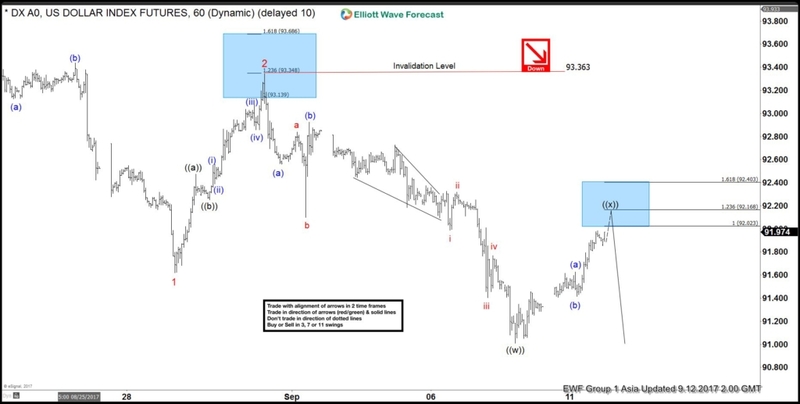 DXY Dollar Index Short Term Elliott Wave view suggests that the decline from 8/16 peak is unfolding as an Ending Diagonal Elliott Wave structure. Down from 8/16 high, Minor wave 1 ended at 91.62 and Minor wave 2 ended at 93.347. 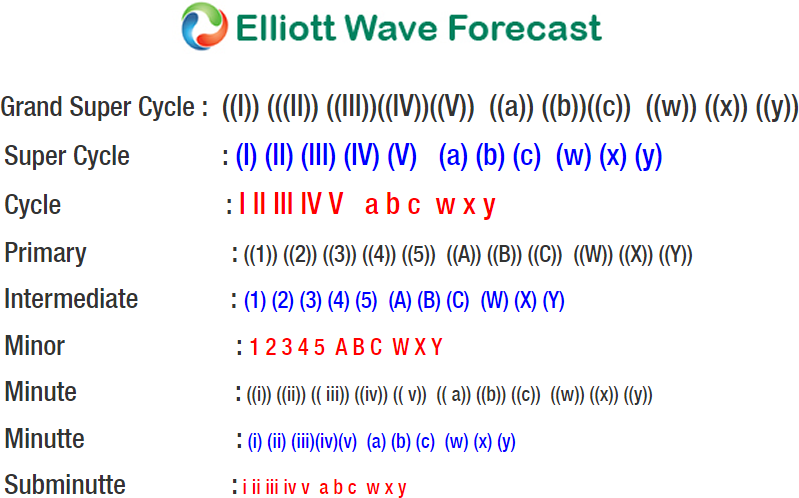 Minor wave 3 is unfolding as a double three Elliottwave structure. Minute wave ((w)) of 3 ended at 91.01 and Minute wave ((x)) of 3 is in progress. The internal subdivision of Minute wave ((x)) shows a zigzag Elliottwave structure. Minutte wave (a) of ((x)) ended at 91.62 and Minutte wave (b) of ((x)) ended at 91.41. The Index has reached an inflection area where Minutte wave (c) = Minutte wave (a) and thus cycle from 9/8 low is mature. Expect Minute wave ((x)) of 3 to end at 92.02 – 92.4. While bounces stay below 93.36, Index should resume lower or at least pullback in 3 waves. 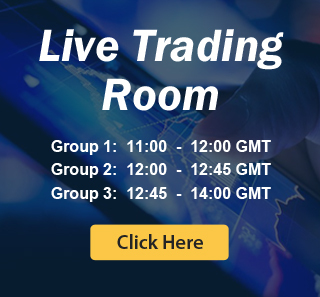 We don’t like buying the Dollar Index. 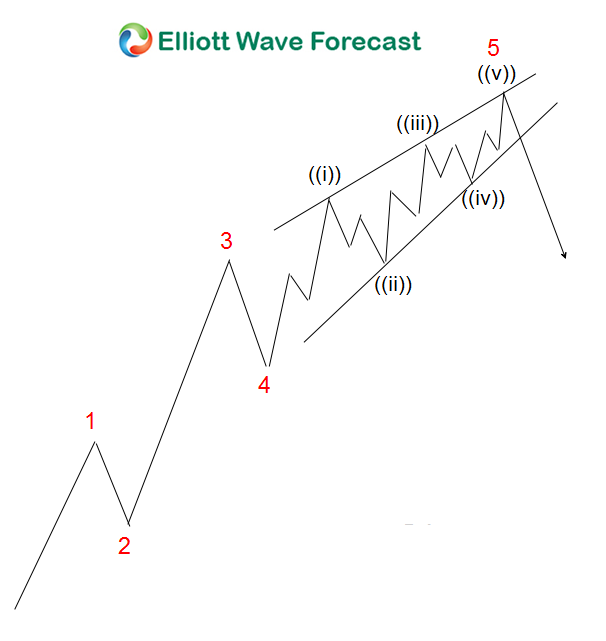 Ending Diagonal typically happens inside wave 5 of an impulse Elliottwave structure or inside wave C of a zigzag. Ending Diagonal has 5 waves subdivision and each wave is further subdivided into 3 waves. Thus Ending Diagonal has the structure of 3-3-3-3-3.